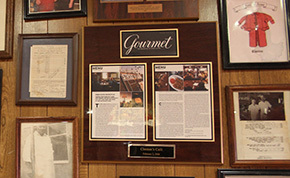 Clanton’s has been featured in Gourmet Magazine for its outstanding Chicken Fried Steak. Columnist Michael Stern was traveling through Vinita in search of the best Chicken Fried Steak on Route 66. He had tried many steaks of various qualities and was impressed with the delicious Chicken Fry served at Clanton’s. You can find the article in the February 2006 issue of Gourmet Magazine. A wide variety of home style meals can be found at this restaurant. 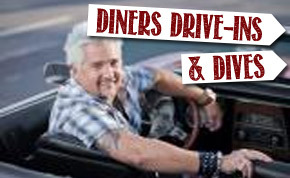 Chicken fried chicken, hearty hamburgers, home made french fries, creamy mashed potatoes and calf fries, yes calf fries. If you don’t know what calf fries are then you really need to come and give them a try. 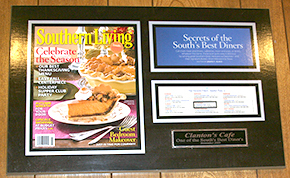 Clanton’s Cafe’ was listed in the November, 2009 issue of Southern Living Magazine as “Secrets of the South’s Best Diners” and as one of our “Favorite Tasty 12”. 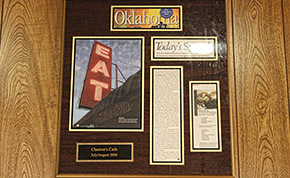 Clantons was also featured in the June 2010 issue as one of “Oklahoma’s Best Chicken Fried Steaks”. Clanton’s has been mentioned in several issues of Oklahoma Living in respect to our presence on Route 66, famous Chicken Fried Steak and our homemade Chicken and Dressing. August 2006 and November 2006 editions.